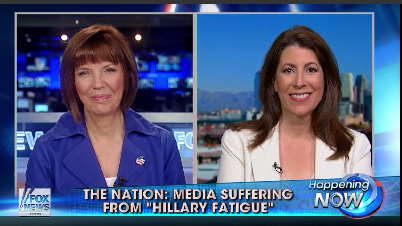 Every Friday Tammy is on Fox News to discuss media’s handling of the politics of the day. This 4th of July the topic was ‘Hillary Fatigue’ and if the media was ignoring Joe Biden. I’m a hippie and even I want them both to be ignored! I think Tammy did a great job as always. I especially like the rapport she and Ms. Miller have. They can disagree but it’s still fun and doesn’t get ugly, and I inevitably learn something, too! I wish more of the Fox segments were like this. I agree, Gina. That’s why I always like watching these segments. Both Tammy and Ms. Miller can disagree and it never gets into a shouting match. In fact, Ms. Miller laughs at Tammy’s jokes (“keep him locked in the attic”, LOL). Thanks for posting this segment, Gina. I missed it live and forgot to DVR it! I too love the repartee between Tammy and Judy. Tammy has a great sense of humor (that we’re used to) but I think it catches Judy and the host by surprise sometimes. It’s great to see their reaction. On Lou Dobbs last week, Tammy’s opening line was that Obama’s approval numbers would go up if he would just retire. LOL. I though Lou’s teeth were going to jump out of his mouth he was laughing/grinning so hard. 🙂 On Lou’s show, they are appropriately named the “A Team”. Yes, thanks Gina…it was good to see this segment–Tammy as a polished conservative independent and Judith Miller, also polished, revealing “a little” of the liberal that lurks inside her. Did I misread her or did she seem to be “all in” but holding back a bit on Hillary’s potential run for the presidency? Some things are more important in national politics than gender equality—such as Benghazi, the IRS, the VA, NSA… corruption at just about every level of this administration. I hope Tammy’s wish comes true and Hillary does run so she can be exposed for who she is (and isn’t) and so we can finally put the Clinton legacy to bed, so to speak. Thanks for this, Gina. A refreshing rapport that comes from, I think, a genuine mutual respect. And I’d like to think that perhaps Judith Miller has a special appreciation for the way that Tammy openly and pointedly defended her and other women in her Washington Post column from 6-26. Who else is out there doing that kind of thing? I thought Hillary Fatigue was a camo pantsuit. You can get some kickin boots to go with it, maybe with 5 inch heels, that would be a corkscrew landing.